Lost to follow-up. It’s a physician’s nemesis. After working tirelessly for fragile hospital patients' recovery, I, the hospitalist, must send the patients off for follow-up, not knowing whether they'll bridge the divide or fall through the cracks. Lost to follow-up is just the reality working and serving here in rural Kenya; it’s like perpetually getting the To Be Continued message, knowing that you’ll never be able to tune in for the rest of the story. One of my “side jobs” is acting as the physician on call for a local NGO, Village Hopecore. Their nurses provide public health services (e.g., school clinics, maternal/child health clinics, etc.) to many, many communities in our area. Almost weekly I get phone calls from their community health workers about children, and sometimes adults, that they come across in the field. I then go see the patients either in their school or home, and many of them are in remote villages far from access to care. Several months ago, I received a call from a nurse at Hopecore about a 3 year old girl who had had progressive abdominal swelling for “months.” We will call her JW. She was not eating and became so weak that she had to be carried everywhere. Her family had not sought care because they were unable to make ends meet at home, let alone pay for a visit to the doctor. Her appearance in clinic was frail, malnourished, and 90% abdomen. Her stomach was large, protuberant, and firm from what lied beneath. I used our Needy Patient Fund (funded by many of you, our supporters, for care for our most needy patients) to cover the cost for a CT scan (~$85). This unveiled a massive tumor, but created another problem; where to send her now? Our hospital does not have the capability or resources to perform this type of surgery, therefore we needed to look elsewhere. I called one of our partner mission hospitals where our Kabarak University residents rotate, Kijabe, to see if they could help. After a phone call and some images sent via WhatsApp a plan was made to transport her to Kijabe for an operation in the coming days. We loaded JW and her mother in our makeshift ambulance truck and sent her off on the five-hour journey. At this point, I assumed that was my goodbye, as she would surely be lost to follow-up. But, the pediatric surgeon at Kijabe, removed the entire tumor without any complications, discharged JW after a short hospital stay, and sent me some pictures of the removed tumor. I was elated to hear of the success, but again assumed that she would now surely be lost to follow-up. 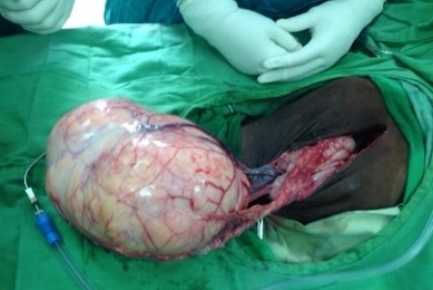 Yes, This tumor was inside her little belly! After this last communication, I often thought about her and wondered how she was doing. Was she gaining wait? Did she feel better, not having that massive tumor in her abdomen? Like many times before, I had resigned myself to speculate and never know. However, last week I received a picture from the Hopecore community health worker who had first called me about her. She went to visit JW and her family. Life had slowly returned to JW’s small body, and she was eating again. Regaining strength had allowed her to start walking, and this brought tremendous joy to both she, her mom and sister. For just a moment, lost to follow-up had been conquered through the amazing communication of my colleagues. Never knowing fully what happens, how things turn out, or even the impact made is an unfortunate part of this particular life, so I celebrated hard when I got a glimpse of this beautiful outcome. To those of you out there who are praying for and giving sacrificially to the work being done here in Chogoria, Kijabe, Hopecore or any other mission caring for those in need, I hope you too will celebrate JW’s amazing transformation with us.